I’ve had a lot of positive response to my New Realm series, and of course everybody has their favorites in the bunch. One of my personal favorites happens to be a popular piece among viewers of my shows and of my website. It may even be your favorite- “Adaptation.” While this painting is rather large (4 feet tall and 3 feet wide), I have come up with a smaller solution that may soon be a new favorite. I found some 4″ x 4″ panels that I just fell in love with- great texture to work with, especially for small details, and the size is just too darn cute. So I have taken the beloved fish character and featured him in a 4 inch panel painting. 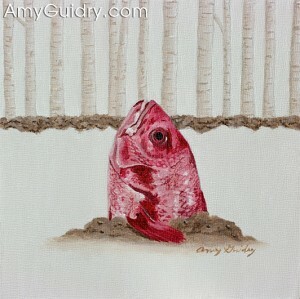 I’ve aptly titled it “Transition.” To view more of my work you can also visit my website at www.AmyGuidry.com.